Gold for June delivery dropped $20.60, or 1.6%, to settle at $1,293.30 an ounce on the Comex division of the New York Mercantile Exchange. The close was the lowest since March 11. 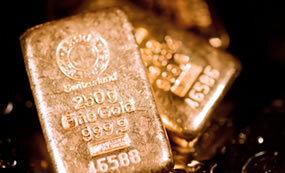 "A combination of elements this week is adding up to notions of slackening demand for the precious metals markets in the coming weeks and months," Jim Wyckoff, a senior analyst at Kitco Metals Inc., said in a report. "A rebound in the U.S. dollar index and chart-based sellers entering the futures markets also worked against the metals markets bulls today." Gold futures ranged from a low of $1,292.90 to a high of $1,313.10. They rose 0.4% on Wednesday — ending at their highest point since March 26, and they climbed 0.5% on Tuesday and on Wednesday. Silver for May delivery tumbled 37.7 cents to end at $14.867 an ounce. Silver futures traded between $14.845 and $15.215. They rose 0.2% on Wednesday, dipped a half cent on Tuesday, and rose 0.9% on Monday. July platinum lost $13.60 to $895.30 an ounce, ranging from $893.30 to $914.90. Palladium for June delivery declined $30.60, or 2.2%, to $1,332.60 an ounce, trading between $1,324.30 and $1,373. Gold declined $6.65, or 0.5%, to $1,298.80 an ounce. Silver fell 8.5 cents, or 0.6%, to $15.16 an ounce.